← World of Blyton Blog has had 2,000 views! This series of posts is inspired by a thread on the Enid Blyton Society Forums, where members are discussing which Blyton was the first they read or bought. Many of them have fond memories of a particular copy of the book(s) they first read, and often lament the loss of such copies due to clear outs or house moves. As a child I had a rather eclectic Blyton collection. Very little of it matched – I had tatty hardbacks, a few neat hardbacks with dustjackets, varying styles of Armada and Knight paperbacks and some rather ugly shiny modern paperbacks (modern = from the 90s!) Most, if not all the older books were handed down from my mum, aunts, uncles and cousins. Despite all these different copies a lot of my ‘main’ series weren’t complete and some series were missing altogether. Now I have an awful lot of old hardbacks my paperbacks are relegated to a box in the loft, but seeing their covers often evokes a particular feeling about the stories they contain or where they came from. Using the wonderful Cave of Books, an amazing project by Tony Summerfield, I have pulled together as many images of my childhood Enid Blyton books as I could and I’m going to attempt to write about their origins and their effect on my childhood reading. I adored the stories of Amelia Jane as a child, in fact I still have a soft spot for them. I remember being horrified at the things she did – especially her first story where she got scissors and cut holes in things like the carpet, the curtains even snipping off the pink rabbit’s tail. Funnily, my sister did something rather similar aged 5 or so (cutting holes in a half knitted jumper and my favourite home-made Sindy dress amongst other things) I wonder if Amelia Jane inspired her? “Naughty Amelia Jane” and “Amelia Jane Again”, Dean impressions illustrated by Rene Cloke. I had the first two books in the series, brightly coloured Dean & Son hardbacks. I’m usually quite disparaging of the Dean editions (been bitten once too many times by sellers describing them as firsts) but I rather like these two as they’re familiar and immediately put me in mind of the wonderful stories inside. I often turn my nose up at reprint illustrators (Rene Cloke included) but looking at the dustjacket for the first edition, I find myself preferring Cloke’s image of Amelia Jane, though it’s clear it’s closely based on Sylvia Venus’ work. Cloke’s internal images may not be better than Venus’ but I find their familiarity comforting, and her particular style takes me right into that nursery alongside the toys. I also think Cloke’s Amelia looks more doll-like, while Venus’ Amelia could be a real child. 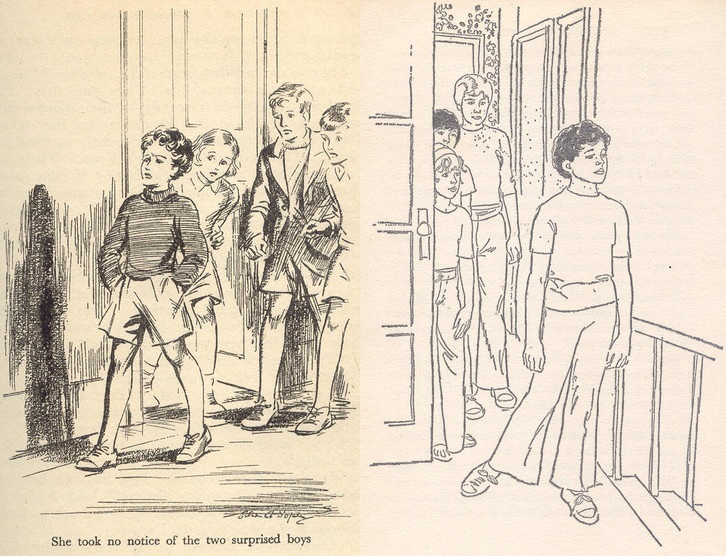 Illustrations of the same scene from “Naughty Amelia Jane”, on the left by Sylvia Venus and the right by Rene Cloke. I just love the cheeky smile on Amelia Jane’s face in Cloke’s illustrations. I had several versions of Famous Five books in my collection (I did have all 21 though). Several (Books 1-3: Treasure Island, Adventuring Again, Run Away Together, 5 and 6: Caravan and Kirrin Island Again, 9 and 10: Fall Into Adventure and Hike plus 14 and 15: Plenty of Fun and Secret Trail) were Hodder and Stoughton hardbacks with red boards. They’d all been owned by two or three family members before me, so were really rather tatty – several didn’t even have their spines any more. I only had book 4 Five Go to Smuggler’s Top and book 11 Five Have a Wonderful Time with dustjackets, (I’m ashamed to say I lost the one from Smuggler’s Top as I liked to display the lovely clean and bright boards underneath it). 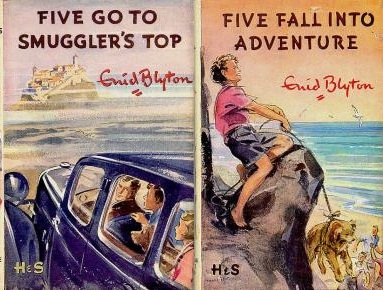 The second version dustjackets from “Five Go to Smuggler’s Top” and “Five Fall Into Adventure”. Book 8: Five Get into Trouble, as well as books 16-19 (Billycock Hill, Fix, Finniston Farm and Demon’s Rocks) were Knight paperbacks from the 70s, bought by my mum to fill the gaps in her collection. And lastly were the 90s paperbacks (in two different styles) bought by my parents so I could read all of the books. Those were Camp (book 14) Sea (12), Mystery Moor (13), Mystery to Solve (20) and Together Again (21). I loved my hardbacks – reading them felt more special somehow than picking up a paperback. I remember classifying the smell of old books as “the smell of adventure” as the two were so intrinsically linked for me. Saying that some of my hardbacks fell into what I’d consider my “least favourites” category while some of the paperbacks are amongst my favourites. I certainly much prefer Eileen Soper’s illustrations to those of Betty Maxey, and for me Soper’s depictions ARE the Five. Depictions of the same scene from “Five on a Treasure Island”, on the left by Eileen Soper and the right by Betty Maxey. Soper captures George’s haughty walk but Maxey seems to have her sleepwalking past! Likewise, the others actually look surprised in Soper’s illustration and completely indifferent in Maxey’s. The less said about the flares the better. Having said all that I’m not offended by Maxey’s covers for the paperbacks I had – but that may just be because they are familiar and remind me of the stories. Most of my 90s paperbacks are amongst my least favourites (Sea being the only real exception) I don’t know if that’s down to the stories themselves, the covers or the complete lack of illustrations. Anyway, I think I’ve rambled enough for one post! Did/do you have any of these editions? If so, do you love them or do you prefer another version? This entry was posted in Personal Experiences, Purchases and tagged Amelia Jane, Betty Maxey, Dean & Son, Editions, Eileen Soper, Hodder, Hodder and Stoughton, Illustrators, Knight Books, My Childhood Books, Rene Cloke, Sylvia Venus, The Famous Five. Bookmark the permalink. bacame the most precious possession. We borrowed other Famous Fives from the Boots Lending Library. Of course since then I have been buying the series in hardback – by no means all with dustwrappers, I also have a selection of paperback copies from the various reprints. I agree (having grown up during the fifties and sixties) that Eileen Soper captured the five to perfection. Lovely article,that somehow I missed…. I think I’m the only person who loves both artists equally???. Both were a lovely,enjoyable part of my childhood reading the Five’s.Unless there is anyone else in Blytonland who feels the same? Don’t be intimidated,the Soper fans won’t bite you! !